As breeding programs blossom at various zoos across the world, many institutions are tasked with more than just breeding and birthing little ones. They’re also expected to make sure their tiniest new residents are developing appropriately and at the right rate. Parenthood—it’s never easy! When should a baby panda first learn to walk? How early is too early for otters to start swimming? 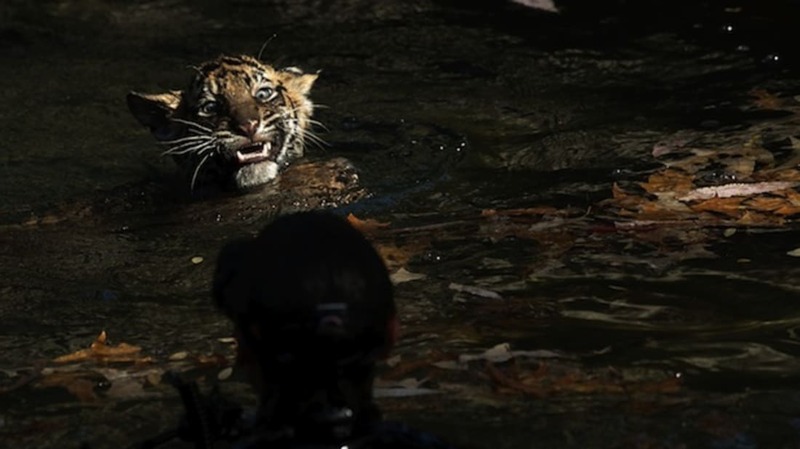 When can infant tigers try out their skills in the water? Zoos know. Here are the milestones zoo babies must hit before crowds get a peek. While learning how to swim might not be the most important thing a wild tiger can learn (we’re betting that running, hunting, and patrolling probably come first), it’s a little different for tigers that live in zoos. Many tiger habitats include deep pond portions in their exhibits for maximum tiger fun time (as well as visitor safety). The Smithsonian’s National Zoo took their baby twin tigers, Bandar and Sukacita, for a swim last month, testing to make sure the cubs, born in August, could hold their own and start hanging out safely in the zoo’s tiger exhibit. The pair were expected to keep their heads above water, swim to the shallow end of the exhibit’s moat, and jump on to dry land. While they didn’t seem too excited when they first hit the water, they both passed with flying colors! Now the dynamic duo can hang out in the exhibit with their mom, Damai. The National Zoo’s tiger twins aren’t the only little ones making big strides lately—the infant Giant Panda cub is currently learning how to walk! The three-month old (which was just named Bao Bao) weighs in at a very healthy 10 pounds, which may have made maneuvering a bit rolly-polly, at least for now. Most pandas start walking between 2.5 and 3 months, so the zoo’s newest black and white is right on track. Though it seems a bit counterintuitive, baby river otters are not born knowing how to swim—they have to be taught. The Oregon Zoo’s baby otter Molalla learned how to paddle back in April, thanks to the patient instruction of his mom, Tilly. Mo’s first swim lesson might look a bit, well, intense, what with Tilly grabbing him in her mouth and dunking him right under the water, but it’s essential for his learning curve. Also—not to worry, Mo can float. Plenty of wild animals learn to stand up soon after birth, but that doesn’t mean that the first time it happens it’s not still entirely eye-opening. Over at Connecticut’s LEO Zoological Conservation Center, the facility welcomed its first live Rothschild giraffe birth back in March. Intent on standing up, she struggles for a bit, faithfully encouraged by her mother, and soon the rest of the curious herd. It may take a few attempts—hey, you try standing up in sawdust—but she soon succeeds, and is rewarded with kisses and a solid cleaning from her mom. Sure, watching baby animals learn how to do just about anything is pretty cute, but there’s something extremely special about seeing the Taronga Park Zoo’s baby pygmy hippopotamus Monifa taking her first swim with a zookeeper. She’s so small! So willing! So happy! The little hippo is a real natural, and that’s a good thing—hippos spend most of their lives in the water. Just because something is an actual part of your body doesn’t mean that it doesn’t take getting used to—and that’s the case with this baby elephant at the Whipsnade Zoo. The newborn is still a bit unsteady on his feet and, combined with the wonder that is a wrinkly, slinky trunk, it’s amazing that he hasn’t just fallen over already. Don’t worry, though, he’ll soon master the use of his trunk, as it’s fit for a large range of tasks—from lifting to digging to taking in water. Meerkat babies are born underground in one of their close-knit family’s many burrows, so it’s a big deal when they first emerge. It’s not only a treat for zoo patrons, but for the entire meerkat clan, all of whom make it their business to make sure that the little ones are OK. Meerkat pups will emerge from the burrow when they're around three weeks old, but the protection doesn’t stop after their first entrance to the aboveground world—they’ll be under the watchful eyes of babysitters for at least another week. Much like their panda cousins, Andean Bears participate in a lot of chubby stumbling before mastering walking. At the Phoenix Zoo, their new baby boy took his first steps back in April, partially thanks to his mother, Rio, who began letting her little one explore on his own when he was just a bit over three months old. Staying limber is a good thing for Andean Bears, who are also skilled climbers (that will come later for Rio’s cub). Back in April of 2011, the Dublin Zoo let its newest little one take his first run after five days of hanging out in the nursery with his mom. He’s a quick little guy, but that doesn’t mean that his mother doesn’t feel the need to stay pretty close by, especially because his eyesight isn’t fully developed just yet. He’s certainly off to a solid start—which is good, because most rhinos can gallop at speeds up to 30 miles per hour once they’re full grown. Another young buck took his first trip into his habitat back in September of 2009 at the Cincinnati Zoo, when a baby Grevy’s zebra cut loose at his home exhibit. While still a bit unsteady on those skinny legs, his exploration efforts are essential to his growth, both mental and physical. The zebras are big grazers when it comes to eating, so a curious spirit (and a quick gait!) are very good things. Penguins might seem naturally adept at swimming, flipping, sliding, and diving, but even those chicks need a little in-water training before mastering their instincts. Earlier this year, the Dublin Zoo took one of its adorable penguin chicks, Joey, for his first swim. The hand-reared chick took to the wet stuff incredibly well, quickly exhibiting some observed behaviors he’s seen the big guys play at—like feather-cleaning and head-dunking.